If you are thinking of buying or selling a home in close proximity to our nation’s capital and Northern Virginia, Clarke County real estate is a terrific option. The experienced team of realtors at Virginia Estates can assist you with your Clarke County real estate needs. Clarke County was the home of Lord Fairfax, Revolutionary War General Daniel Morgan, and George Washington’s daughter Nellie Custis. The region was also the birthplace of Robert E. Lee’s wife, Mary Anna Randolph Custis. Early settlers migrated from the Tidewater region of Virginia to live on land grants exceeding five million acres that were given to Lord Fairfax. The region, which quickly became known for wheat growing, became a county in 1836 when it was sectioned off from Frederick County. Clarke County, named for Revolutionary War Colonel George Rogers Clark, was once claimed by the Iroquois and was the first settlement of the Virginia Colony. The history of the region is characterized by wars and shifts in ownership and power. During the American Civil War, John S. Mosby, “the Gray Ghost” of the Confederacy, raided General Sheridan’s supply train in the summer of 1864, in Berryville. Numerous battles were fought in the county, including the Battle of Berryville in 1864. Early in the 20th century, Harry F. Byrd, Sr. made his home in Berryville, where he focused on agriculture, growing peaches and apples. He soon shifted gears to politics and served as a one-term Governor of Virginia and more than 30 years as a senator. Individuals with a keen appreciation for history, old houses, the American Revolution and the Civil War, contact our office to learn more about Clarke County historic homes for sale. Berryville, the historic epicenter of the county, is located in the northern Shenandoah Valley and is a prime example of a colonial crossroads community. Berryville became the county seat of Clarke County in 1836. Today its historic homes are national treasures, and its main street community offers an array of dining options. To learn more about its restaurants, including Boyd’s Nest, Mario’s Pizza, and Santorini Grill, visit www.berryvillemainstreet.org. Clarke County resides in the northern Shenandoah Valley, in close proximity to the Blue Ridge Mountains. The Shenandoah River offers scenic canoeing at the base of these scenic mountains. The Appalachian Trail meanders through Clarke County, with overnight rustic shelters and a castle’s view of the Shenandoah Valley. Other trails that cross the county support bicycling and horseback riding. The initial battles of the Northern Army’s attacks on the South are preserved by several entities on the 195 acres of the Cool Spring Battlefield, where college students and the public are invited to learn about regional history. This includes Native American history, as well as momentous battles that helped define our nation. The Barns of Rose Hill (in Berryville) offers art, music, history and a venue available for public/private functions. Berryville Main Street Summer Craft and Farmers Market is a monthly happening, an event worthy of attendance, offering local artist’s and farmer’s wares for public consumption. Check out some of the other “things to do” in Clarke County. 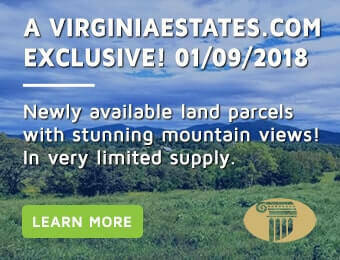 If you are interested homes for sale in Clarke County, VA, contact Rick Walden and the team at Virginia Estates. Our realtors and agents list some of the most beautiful properties in the Commonwealth and are true experts in the Clarke County real estate market.